Love love love! I’m running it as I type! Thank you! Great designs. Put them on towels for a gift and the recipients loved them! This pattern came out very nicely. I love this design, but my needle broke right in the middle of it. I think it was too thick for the size needle I was using. This rooster embroidered very nicely. There was one small space that did not fill in, but overall I was very satisfied. A good country morning from nature's alarm! Our pretty and colorful rooster is a perfect addition to any country décor. 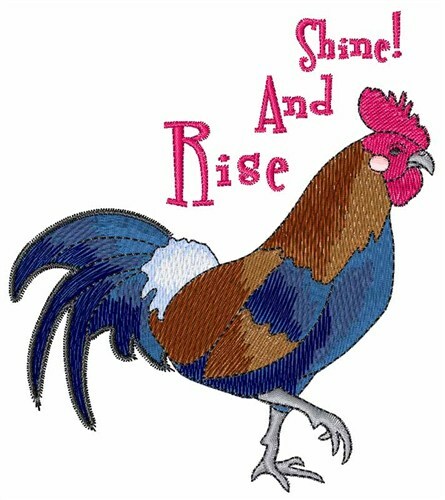 Hopscotch is happy to present Rise And Shine machine embroidery design which has 13192 stitches and is [87.52 mm x 99.33 mm] large. If you would like to view more embroidery patterns please search on our embroidery designs page.